Our clients can also avail from us an exclusive range of Automatic Carton Taping Machines for Food Industry. These are designed and manufactured by the professionals of our firm in compliance with the industry standards. These sealing machines use instant heat for various industry purposes. Moreover, our offered machines are basically used for sealing various pharmaceutical, pesticide and food products. 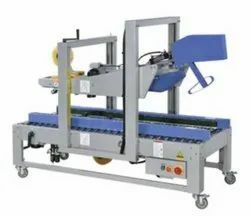 When carton is fed into the machine , the machine will fold the carton's front flap, rear flap and side flaps automatically thereafter the taping onto the carton is done .The height and the width of the carton can be adjusted manually by lead screw, mechanical adjustment. This machine is suited for batch type of automated production line. Looking for Automatic Carton Taping Machines for Food Industry ?